Macropod is the common name for any of the terrestrial and arboreal marsupials comprising the mammalian family Macropodidae, characterized by strongly developed hind legs, long tails, thin necks, relatively small heads, generally prominent ears, and a predominantly herbivorous feeding behavior. There are more than 60 extant species of macropods placed in 11 genera, including the kangaroos, wallabies, tree-kangaroos, pademelons, and several others. 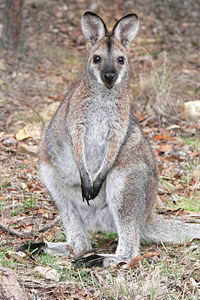 Macropods are largely found in Australia, New Guinea, and several Indonesian islands. In Australia, macropods were the main animal group exploited as a food resource, but also were considered "partners" in the land and were featured prominently in their culture and dreamtime stories. European settlers also used them for food and for hides. Eventually, many macropods became considered as pests that competed with the livestock and even today they are heavily hunted, whether as pests or for commercial harvesting. Six species have become extinct after European settlement and some species went extinct after the Australian Aborigines arrived and before Europeans arrived. While many species maintain healthy numbers, today one species is considered critically endangered, while seven are endangered, and about 18 are vulnerable for near threatened. The primary causes of declines are loss of habitat, competition with introduced and domestic species, and predation from introduced carnivores (cat and red fox) (Lundie-Jenkins 2004). Macropods belong to the marsupial order Diprotodontia, a large and diverse group that includes, in addition to the macropods, the koalas, wombats, and possums. 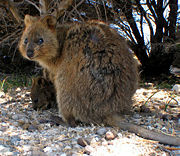 The family Macropodidae belongs to the suborder Phalangerida, with the possums and gliders, while the wombats and koala belong to the suborder Vombatiformes. Macropods are further divided into two subfamilies, the Sthenurinae and the Macropodinae. While the Sthenurinae was a successful group in the Pleistocene, it now has only one extant species, the banded hare-wallaby (Lagostrophus fasciatus). All other extant macropods belong to the subfamily Macropodinae (Lundie-Jenkins 2004). Macropods have very large hind legs that make the upper body and forelimbs look small, relatively thin necks, and a long, powerfully muscled tail. 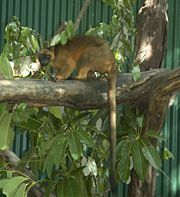 All have relatively small heads and most have large ears, except for tree-kangaroos, which must move quickly between tight branches. The term macropod comes from the Greek for "long foot" or "big foot" and it refers to the fact that most macropods have a very long, narrow hind foot. 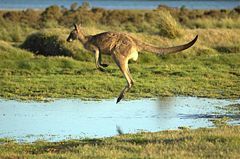 This enables the kangaroos, wallabies, and tree kangaroos to have a characteristic hopping gait, with the kangaroos the largest mammals to hop on both feet (Lundie-Jenkins 2004). The hind feet have a distinctive arrangement of toes: the fourth toe is very large and strong, the fifth toe moderately so, the second and third are fused, and the first toe is usually missing. The short front legs have five separate digits. Some macropods have 7 carpal bones instead of the usual 8 in mammals. A pademelon from Tasmania. Although obscured by fur, most of this macropod's lower body consists of legs. Macropods vary in size considerably. The adult hare-wallabies weigh only about 1.4 kilograms (3 pounds) and have a head-body length of 290 millimeters (11 inches), while the large gray kangaroos weight up to 85 kilograms (187 pounds) and have a head-body length of up to 2300 millimeters (91 inches) (Lundie-Jenkins 2004). There also is a large range of colors, from sandy red through black, as well as intermediate colors and mixes, and some with distinct markings, such as stripes, patches, and so forth (Lundie-Jenkins 2004). The unusual development of the hind legs is optimized for economical long distance travel at fairly high speed. The greatly elongated feet provide enormous leverage for the strong legs. But there is more to the famous kangaroo hop: Kangaroos and wallabies have a unique ability to store elastic strain energy in their tendons. In consequence, most of the energy required for each hop is provided "free" by the spring action of the tendons (rather than by muscular effort). The main limitation on a macropod's ability to leap is not the strength of the muscles in the hindquarters. It is the ability of the joints and tendons to withstand the strain of hopping. In addition, there is a linkage between the hopping action and breathing. As the feet leave the ground, air is expelled from the lungs by what amounts to an internal piston. Bringing the feet forward ready for landing fills the lungs again, providing further energy efficiency. Studies of kangaroos and wallabies have demonstrated that, beyond the minimum energy expenditure required to hop at all, increased speed requires very little extra effort (much less than the same speed increase in, say, a horse, a dog, or a human), and also that little extra energy is required to carry extra weight—something that is of obvious importance to females carrying large young in their pouches. Like the eutherian ruminants of the northern hemisphere (sheep, cattle, and so on), macropods have specialized digestive systems that use a high concentration of bacteria, protozoans, and fungi in the first chamber of a complex stomach to digest plant material. The details of organization are quite different, but the end result is somewhat similar. Tree-kangaroos have smaller ears for easier maneuvering between tree branches, and much longer tail. While kangaroos and wallabies are terrestrial, the tree-kangaroos are arboreal, being adapted for life in trees, but slow and clumsy on the ground. on the ground, they move at about walking pace and hop awkwardly, leaning their body far forward to balance the heavy tail. But in trees they are bold and agile. They climb by wrapping the forelimbs around the trunk of a tree and hopping with the powerful hind legs, allowing the forelimbs to slide. Macropods are predominately herbivorous, but some species will eat invertebrates and fungi (Lundie-Jenkins 2004). While some macropods are browsers, most are grazers and are equipped with appropriately specialized teeth for cropping and grinding up fibrous plants, in particular grasses and sedges. Smaller species tend to seek out seeds, fruits, actively growing plants and other high-quality food items, while larger kangaroos can process lower=quality food items and consume a large variety of plants (Lundie-Jenkins 2004). A Forester kangaroo "flying" over a puddle in Narawntapu National Park, Tasmania. Small, selective feeders tend to be dispersed and solitary, while larger grazers tend to be gregarious, including some larger species that form groups ("mobs") of 50 or more animals (Lundie-Jenkins 2004). Macropods are promiscuous in mating system. Gestation in macropods lasts about a month, being slightly longer in the largest species. Typically, only a single young is born, weighing less than a gram at birth. They soon attach themselves to one of four teats inside the mother's pouch. The young leave the pouch after 5-11 months, and are weaned after a further 2-6 months. Macropods commonly reach sexual maturity at one to three years of age, but it depending on species (Poole 1984). However, while the larger kangaroos species may breed at two to three years, in some of the smaller species the females cna conceive at or slightly before weaning at four to five months (Lundie-Jenkins 2004). The young are born very small and the pouch opens forward. 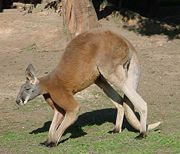 Five "legs" for moving slowly while browsing: the forelimbs and muscular tail take the animal's weight while the hind legs are brought forward: a Red Kangaroo. 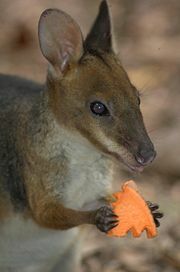 A pademelon from Port Douglas, Queensland area eating a slice of sweet potato. Although normally grazing straight from the ground, a macropod would eat a treat in small bites while holding it in its hands. 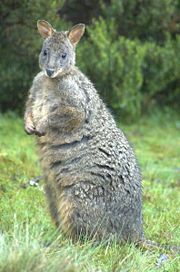 There are two subfamilies in the Macropodidae family: the Sthenurinae was highly successful in the Pleistocene but is now represented by just a single species, and a vulnerable one at that, the [bBanded hare-wallaby]]; the remainder, about 60 species, makes up the subfamily Macropodinae. A number of extinct species have been discovered. The earliest known fossil macropod dates back about 11.61 million years ago (mya) to 28.4 mya, either in the Miocene or Late Oligocene, and was uncovered in South Australia. Unfortunately, the fossil could not be identified any further than the family. A Queensland fossil of a species similar to Hadronomas has been dated at around 5.33 mya to 11.61 mya, falling in the Late Miocene or Early Pliocene. The earliest completely identifiable fossils are from around 5.33 mya. The following taxonomy was drawn from Haaramo (2004), with "†" symbolizing extinct taxa. Groves, C. 2005. Macropodidae. Pages 58-70 in D. E. Wilson, and D. M. Reeder (eds. ), Mammal Species of the World, 3rd edition. Johns Hopkins University Press. ISBN 0801882214. Haaramo, M. 2007. Macropodidae. Mikko's Phylogeny Archive. Retrieved November 9, 2008. Lundie-Jenkins, G. 2004. Macropodidae. In B. Grzimek, D. G. Kleiman, V. Geist, and M. C. McDade, Grzimek's Animal Life Encyclopedia. Detroit: Thomson-Gale, 2004. ISBN 0307394913. Poole, W. E. 1984. Macropodidae. Pages 862-871 in D. Macdonald, The Encyclopedia of Mammals. New York: Facts on File. ISBN 0871968711. This page was last modified on 2 December 2008, at 16:38.